If you’re a hunter or outdoor enthusiast, you know how important a good survival knife is. It’s great to have on hand for cutting & carving wood, skinning, and trapping – not to mention, getting you out of a sticky situation if need be. 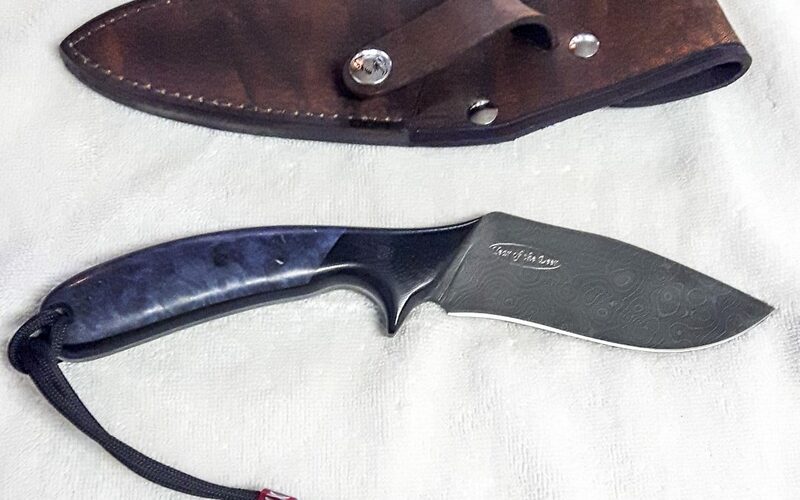 Here’s an example of one of our latest custom knife orders, a 5″ mini survival knife. Handcrafted by Scott and built to last a lifetime! The handle is presentation grade blue dyed stabilized birch burl with double black bolsters and liners. The pins are 3/16″ black canvas Micarta and a 3/8″ black canvas Micarta thong tube. It also comes with a wrist thong. 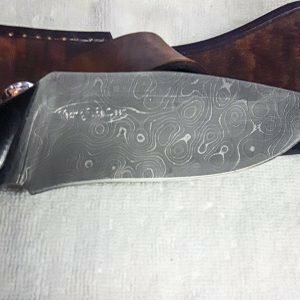 The steel is Alabama Damascus in Buckshot Pattern, with a Rockwell hardness of 58. It also comes with a perfectly fitted sheath, made from top quality 9/10 ounce leather. The leather has a Terra Cotta finish and is hand sewn and hand dyed. You can also see the engraving on the blade, near the handle. This was done at a local engaging shop, Engrave It, in Courtenay, British Columbia. You can request to have your custom knife engraved with anything you like – the choice is yours! Interested in one of your own? We make this same 5” Mini Survival Knife using S30V steel with a Rockwell hardness of 60. But when you make a custom order, the handle, steel, and materials can be tailored to whatever you want. 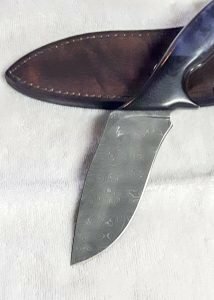 We can also guide you on the best choices for materials and construction so your knife is the toughest, and best looking, it can be. All Sandstorm custom survival knives come with a lifetime warranty, free lifetime sharpening, and a beautiful leather sheath at no extra charge. Order early! It takes time to create your custom knife. Time will vary depending on availability of materials and our current knife order queue. For a price quote, contact us or call 250-287-2194.